Female construction workers earn on average about $2.50 less per day than their male counterparts, are given fewer opportunities to learn new skills and are victims of outdated gender stereotypes, a new report says. 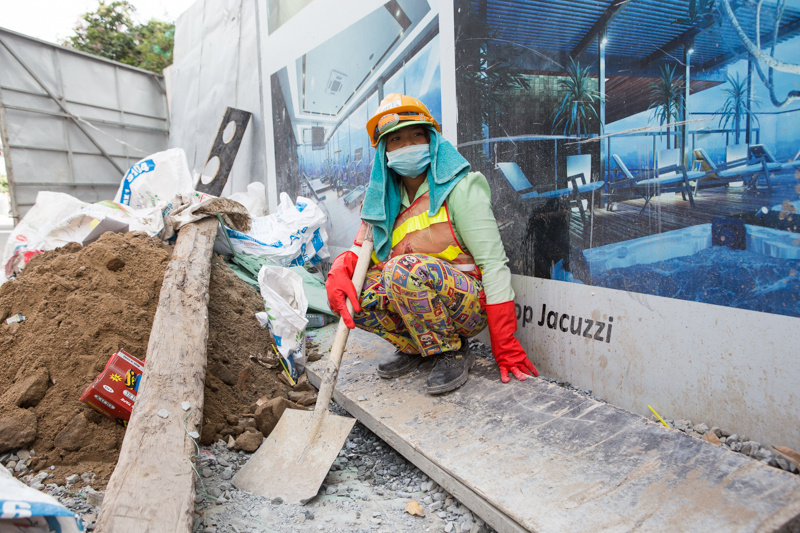 “Labour Rights for Female Construction Workers,” released today by CARE Cambodia, a global anti-poverty NGO with a focus on women’s issues, details results from a survey of 286 female construction workers and their employers in Phnom Penh amid the country’s booming construction industry, where women make up 20 to 30 percent of the workforce. “Gender stereotypes currently prevent female construction workers from performing certain tasks and gaining relevant useful skills,” it says, citing responses from women who said they were forbidden to use heavy machinery or work up high. Rath Kalyan, a CARE project manager for labor rights, said it would not be easy to change “deeply entrenched social gender norms,” but company owners needed to understand that gender equality in the workplace is mutually beneficial. “For example…men are more likely to take days off due to physical exhaustion, and there is a case to be made that allowing women to assist in tasks would lessen their burden, especially when there is a labor shortage and enough jobs for everyone,” she said in an email on Wednesday.